Meet your new chapter leaders! Lynne Pace is CFO of DL Withers Construction. She has been a member of CFMA since 2005. She loves her job because of the team of awesome people that she gets to work with that work hard and laugh a lot together while contributing to the growth of Phoenix. Away from the office Lynne is a drag racing fan, does counted cross stitch and enjoys reading. Michelle Walker, CCIFP, SPHR is VP of Finance & Administration at SSC Boring. She has been a member of CFMA for 7 years. Her favorite thing about her job is creating opportunities for employees to grow and be developed. Outside of work, if she's not busy with her kid's activities she can be found outside running, at the gym or in the kitchen baking. Jennifer Hopper, CCIFP is the Prequal Controller for DPR Construction. She has been a CFMA member since 2002. She loves the company she works for and the people she works with. Jen enjoys travelling with her family, and has spent a week or two in Alaska for the past 4 out of 5 summers! Ryan Evans, CPA, CCIFP is the CFO of the ACC Companies. He, too, has been a CFMA member for 10 years. His favorite part of his job is that it never gets boring - each project is unique and presents new challenges and opportunities. When not busy at work, his kids ranging in age from preschool to college fill up every available minute with their schedules. In addition to our officers, we also welcome new board members Randy Brammer, Diana Bujnovsky and Kristin Calle. Thanks to past officers, Dave Miller and Debby Anderson, and past board members Keith Beiber and Bill Judge, who ended their terms. until a permanent replacement is named. If you have any questions, please reach out to one of the officers. Register today - event is next week! The Valley of the Sun's planning committee has become a driving force behind this movement that is gaining steam nationally. Our April 7 event is being looked at as a model to take to other chapters across the country. Don't miss being a part of this groundbreaking event, and making sure that your company executives, safety and human resource personnel attend as well! Register here today! Non-members are welcome, and there is no charge for attending, so invite others that you feel would benefit. If you have questions or would like further information, don't hesitate to e-mail any of the following committee members: Jim Bracy, Dave James, Michelle Walker or Marj Weber. We are less than four weeks away from one of the year's most exciting events - the Construction Executive of the Year Awards & Dinner. There is plenty to be excited about for this year's event, presented by Lovitt & Touche, on April 28th at the Montelucia Resort & Spa. The finalists and Pioneer Award recipient have been named and the event is shaping up to be one of the best ever! All that is left is you - make your sponsorship or reservation. The YCFPs held a kickball event on Thursday, March 24th at Jaycee Park in Tempe. Around 30 people came out for a fun afternoon and shared a lot of laughs. Thanks to Eric Pach and the other organizers for putting together a great event! 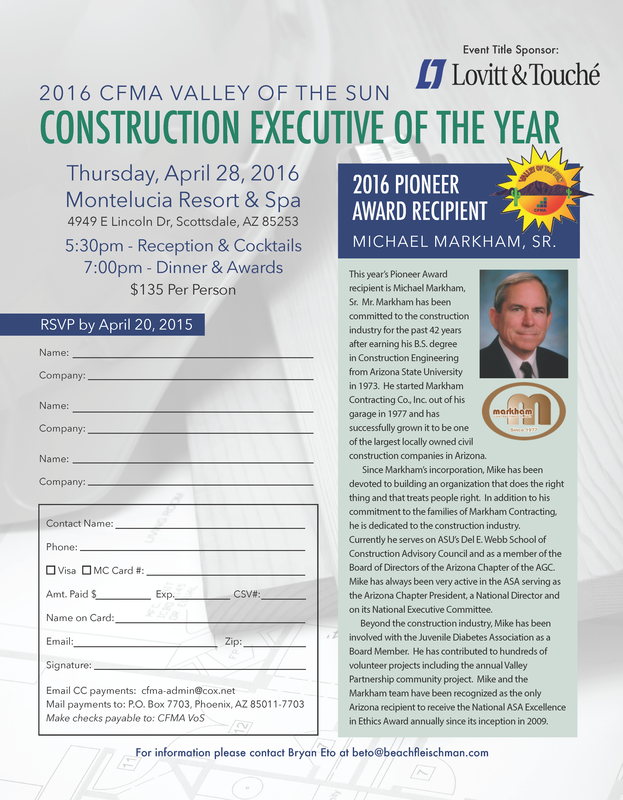 Their next event is a quarterly meeting with guest speaker Kevin Burnett of Sundt Construction. This will be held on Tuesday, April 19th from 4 - 6 pm at the offices of Sacks Tierney. Please E-mail Eric Pach to RSVP. Join us on Thursday, April 21st at the Doubletree to hear Jeff Robinson of PAS present on Compensation Challenges in the Construction Industry. This certainly a hot topic as we all search for ways to recruit and retain employees, so don't miss this very relevant and practical session. Registration is open here. Sundt Construction was recently named one of the Safest Construction Firms of 2015 by AGC. VoS Member and Past President, Kevin Burnett, Sr. Vice President, CFO of Sundt, says "This is due to the hard work of Sundt's safety department, our employees and our Safety First Focus." Join your fellow VoS Members to lend a helping hand on a Habitat for Humanity project on Saturday, April 30 from 6:30 am - 1:30 pm. Our group will be completing the doors & trim, and prepping the interior for paint. Click here to register or for more information. Space is limited to the first 25 to sign up! Questions? E-mail Michelle Walker or Cliff Spickler. Registration is open for the annual CFMA National Conference and hotel rooms are filling up fast! Don't miss out on attending what is always an amazing educational opportunity and a fun, energizing experience. There are three first time attendee scholarships available - any VoS members who have not attended a National Conference before are eligible to apply. The scholarship covers the registration cost for the full conference. For more information or to apply, e-mail for the application and details. Amber Ashmore, Interim Chapter Admin.